Dry Hopping has never been easier than with the Dry Hops addition system.No more manual handling of hops bails into fermentors. No more clogging of pumps and pipes.The Dry hops system allows for quick addition of Hops in a safe and simple, efficiaent way. 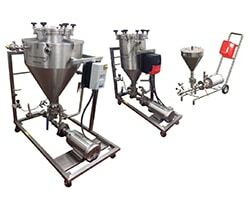 Ampco Pumps Company is proud to present the ROLEC DH45, a smaller, simpler version of the DH90 and DH250 dry hopping systems. Now breweries of any size can enjoy the many bene?ts of ef?cient and safe dry hopping. The DH45 uses an SBI blender to recirculate the fermenter, induce dry pellets and blend. This process maximizes pellet dispersion, ?avor and aroma. Increased surface area and forced contactct results in decreased tank-time and, in many cases, greater yield. An integrated CO2 inlet on the funnel creates a CO2 blanket over the hops and mitigates oxygen contact. The ROLEC DH units utilize the Ampco SBI pump to recirculate a fermenter and simultaneously induce dry hop pellets into the stream of beer. The pellets are held in a pressurized chamber, which is purged of air using carbon dioxide (CO2). Pellets can be induced into fermenting, finished, or crashed beer. The shear pump creates a differential pressure for induction of the pellets from the hop vessel. The pellets are chopped to just the right size so they can settle during the dry hop holding period.